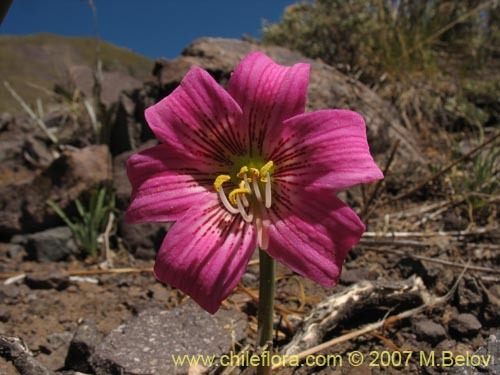 This is another Rhodophiala of the Central Andes of Chile - it has big flowers, pinkish or whitish in color, which can not be mistaken for any other plant. Although not very frecuent, where they grow, the density of these plants may be quite high, creating a nice speckled carpet of flowers in late spring. This is a perennial bulbous plant of about 10 - 20 cm. The leaves are generally absent during the flourishing. The leaves are linear and 10 - 20 cm long and about 3 -4 mm wide. The plant has big, pinkish or whitish flowers with darker stripes. 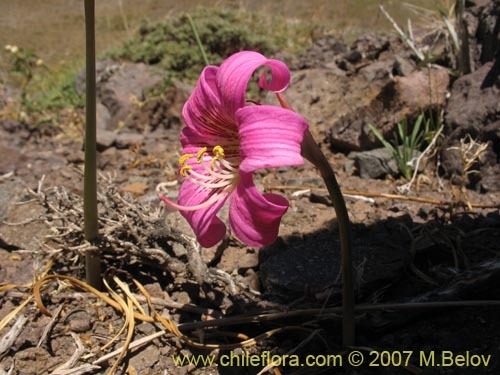 The flower can be as big as 10 cm in diameter and has six yellow stamens and one pinkish pistil which is quite longer than the stamens, and the flowers are solitary (this differentiates them from the other two commonly found Rhodophialas - the splenderosa, and bakeri). The seeds come in a three-parted greenish-brown capsule which contains about 20 - 40 shiny black flat round seeds of 1 cm of diameter stacked up one on the other like pages of a book. The flowers appear in December - January, generally later than other Rhodophialas, and the seeds are ripe in February-March. 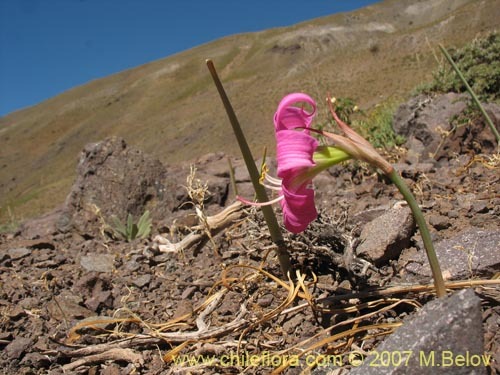 This plant gows at high elevations in Central and Central-southern Chile, in Talca at about 1800 - 2200 m., in Santiago at 2800 - 3200 m., well above the tree line, prefers sunny spots, generally on sandy or rocky ground with good drainage and poororganic matter content. 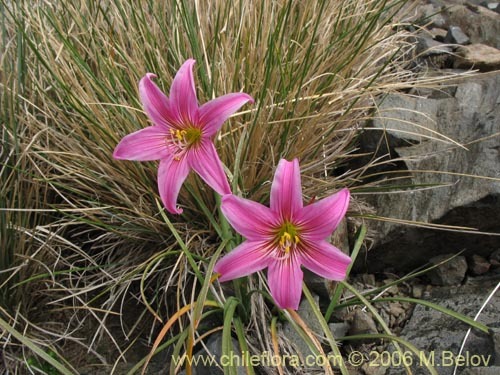 It needs a lot of water during its vegetative growth (in early spring), but during the flowering it can withstand dry spells of up to two months (the bulbs store nutrients and water necessary for flowering). It can be easily propaged by seeds or, much more complicated, by division of bulbs. The seeds must be immersed in water for a day o two and then stratified in damp sand for three to four of weeks at 5�C (this is absolutely required, without it thegermination will be very low"). Then, the seeds are planted in warm soil (20�C). Do not expect flowers for at least two seasons, because the bulb needs time to develop.